It is a bloody great intro. Superb. Yes, in the next update this intro will be replaced with fixed one. A fixed version will replace this one I believe. Just fill area $0800 - $0808 with $ff to get 100%. 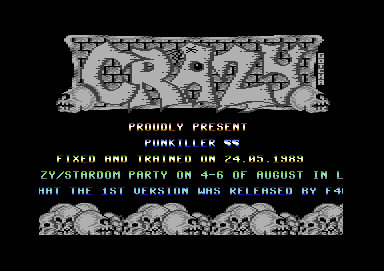 As far as i remember the lines left and right of the logo on this screenshot resulted from the first byte of the charset being overwritten if you resetted the machine and restarted the intro. This one was ma fav. from Crazy clan: super introtune (Rampar introtune), nice gfx (with skulls), 8x8 (with skulls) and skulls (certainly).